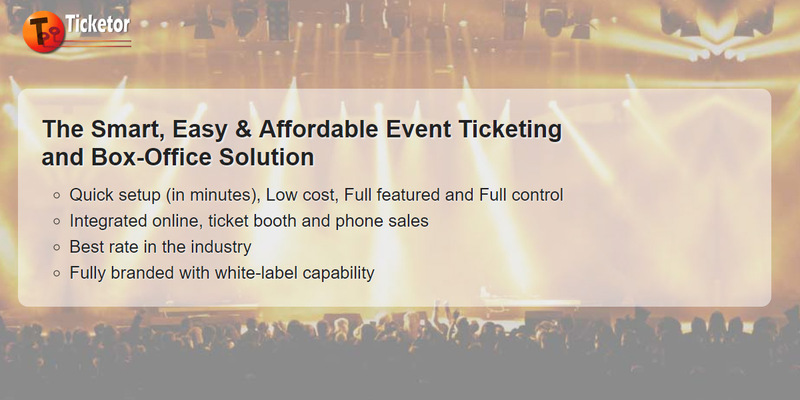 When it comes to selling tickets online, one concern is how and when the buyer is going to get the tickets and how the event organizer can provide fast, easy, reliable and cost effective methods for ticket delivery. Ticketor fully supports all these delivery methods. The event organizer should offer a couple methods to make sure it is convenient for all buyers. The offered methods can change from event to event and from time to time. For example, you can offer “Mail” for early buyers while last-minute buyers won’t have the option. Or you can add or remove a delivery method at any time during the sale. Some delivery methods have to stop a certain amount of time before each event to give you enough time for delivery. Some others don’t require this time and can continue till the end of sale. Ticketor allows you to set the time required for the shipping and that specific delivery method will become unavailable at certain hours before each event. Based on the delivery methods you offer, you may need to allocate some resources to provide the service. While some methods are more costly, some others may have no cost or little cost. As always with Ticketor, you control all charges. It means that you can associate a fee to each delivery method and the buyer will have to pay the fee if they select that delivery method. Here we are going to explain each delivery method in detail and the considerations for offering each one. The easiest, most automated and most popular delivery method is E-Tickets. It allows the buyer to print their tickets right after the purchase or have them on their phone. It is the preferred method for both the buyer and the event organizer. There would be no extra cost or effort for the organizer and it is totally safe since the e-Tickets are secured with barcodes/QR codes and can be validated at the gate. (For more information about e-ticket security and validation please visit our blog Gate Control and E-Ticket Validation). If the user doesn’t have a printer at the time of purchase or is purchasing using a tablet or phone that doesn’t support a printer, they can print or access their tickets later on from the confirmation email or by logging in to their account. Our records indicate that over 94% of the buyers choose e-Ticket as delivery method but there are buyers who don’t have access to a printer/Smartphones and prefer to receive their tickets using other methods. It is recommended that the organizer offer at least one other method. You don’t have to stop e-ticket sales. It can continue till the end of sale, even after the admission is started. There is usually no considerable fee involved for e-ticket delivery; however you can choose to charge buyers for that. There are some venues that won’t allow you to issue and use your own tickets. These venues may force you to only use the tickets that they provide for you. In this case you cannot offer e-Tickets as a delivery method. Digital tickets are exactly the same as e-Tickets but the user doesn’t necessarily have to print them. If printed, they look exactly like e-Tickets. The user can have them on their smartphone instead of printing them out, and can show the smartphone to the gatekeeper at the gate. The gatekeeper scans the barcode right from the smartphone and admits the buyer. While this method is more flexible than e-tickets and can save some trees, it requires that the barcode scanner that is used at the gate be capable of scanning from the phone display. Phone cameras and most (but not all) barcode scanners have this capability. You don’t have to stop digital ticket sales. It can continue till the end of sale, even after the admission is started. There is usually no considerable fee involved for digital ticket delivery; however you can choose to charge buyers for that. Will-Call is the method that the buyer purchases the tickets online and pays for the tickets in full, but picks it up later at some designated location. The most common location to pick up the tickets is a booth or desk at the venue. It could also be a local office or retail location. The delivery time may also vary. The tickets may only be available from a couple hours before the event or they may be available as soon as the purchase is complete. When the buyer buys the tickets using will-call as the delivery method, they receive a confirmation number and a notice that they have to present their ID or the credit card used during the purchase to pick up the tickets. If you allow the user to pick up their tickets before the event day, then the location should be equipped with a computer and printer. When the buyer shows up to pick up the ticket, you check the ID and confirmation number, pull the ticket up on your website, print it and handle it to the buyer. The ticket will be marked as delivered. On the event date, you can either follow the same approach and print the tickets as the buyer shows up to pick them up, or you print all will-call tickets by using the “Delivery Reports” section of your site and hand them out. You can print on regular papers using a regular printer or professionally print hard tickets using a thermal ticket printer. The tickets will get printed in alphabetically order with a header/receipt for each invoice that shows the buyer and invoice information. The tickets printed for will-call delivery, are similar to the e-tickets. They are secured with barcodes and QR codes and can be validated the same way as e-tickets. The only difference is that these tickets are printed by the event organizer as opposed to buyers. If you are following the approach to print all tickets in bulk, you should probably disable the will-call option before printing. However, if you are planning to print tickets as the buyer shows up, you don't need to stop the will-call delivery. You can disable the delivery method either manually or by configuring it to stop certain hours before the event. Since there is a small fee involved in printing tickets (ink and paper) and you need some staff to deliver the tickets, you may decide to charge buyers for will-call delivery method. As mentioned before, some venues won’t allow you to issue and use your own tickets. These venues may force you to only use the tickets that they provide. If this is the case, then will-call will be the most feasible delivery method but you cannot easily print and deliver e-tickets. Instead you will have to use the tickets provided by the venue. In this case, using the “Delivery Reports” section of your website, you can print what is called “will-call headers”. There will be one page per buyer and on each page there is a header with the buyer’s name and invoice information and a list of their tickets. The list will include section, row and seat numbers for assigned seat events. Then you will have to find and attach the actual tickets to each page using a staple and take them to the venue for delivery. It could be a time consuming process if there are many tickets to be attached so consider the amount and the time you need to do that. In this method the buyer purchases the ticket online and receives them in mail. Organizer may offer multiple mail options based on delivery speed and cost. This method obviously is the most expensive method since it involves mail (shipping) and handling costs. Organizer should consult postal services and find out about the services that are guaranteed to be delivered in a certain amount of time and the cost involved with each service. Usually the faster the shipping method, the more costly it is. So it is good if the organizer offers a couple different options so that the early buyers can pick the slower and cheaper method and the last minute buyers will have to choose the faster and more expensive ones. The organizer will be responsible to check the new sales that require shipping on a regular basis, print the tickets and mail them to the buyer using the requested mail service. The “Delivery Reports” section of your site allows you to print all the mail tickets that are sold in a date range. You can print them on letter papers, fold them, put them in an envelope and mail them. Each page will have a header with the buyer’s name, information and shipping address or you can print invoice by invoice and mark the invoice as shipped. If the tickets are lost in mail or not delivered, you can easily void those tickets and issue new tickets instead. You may need to ship them again or ask the buyer to pick them up at the venue. You should consult your postal service to find out what is the maximum delivery time for each type of mail service. Also, consider the weekends and holidays. Some mailing services don’t pick up or deliver on weekends and/or holidays. Also, consider the time you need to print the tickets and ship them (handling time). Then make sure each mail delivery method, stops at certain days before the event to leave you enough time for shipping and handling. Consult your postal service to find out the cost for each delivery method. You may also need to add the handling fees. As mentioned before, some venues won’t allow you to issue and use your own tickets. These venues may force you to only use the tickets that they provide. If this is the case, then “mail” will be the most feasible delivery method but remember that you cannot easily print and ship e-tickets. Instead you have to use the tickets provided by the venue. In this case, using the “Delivery Reports” section of your website, you can print what is called “Mail headers”. There will be one page per buyer and on each page there is a header with the buyer’s name, invoice information, shipping address and a list of their tickets. The list will include section, row and seat numbers for assigned seat events. Then you will have to attach the actual tickets to each page using a staple and ship that. It could be time consuming if there are many tickets to be attached so consider the amount and time you need to do that. For more information visit us on Ticketor or email us at AdminSupport@Ticketor.com.